✗ The world's lightest propellers : less than 500 gr for a 2-blade ! Propellers of 3rd generation : efficient, ultra-light, quiet and very strong. Made in France since 2008 : see page the E-PROPS company. Adapted diameters and blades' numbers defined according to engines and reducers. - Extensive research of the E-PROPS design department, with many tests campaigns on wind tunnel et the development of an exceptional software (LmPTR©). - A manufacturing process which allows a very lightweight, this a high reactivity. - Specific E-PROPS designs with high CL profiles. - SCIMITAR shape : more thrust, less inertia, fuel economy and noise reduction. The E-PROPS PLUG'n'FLY, 100% carbon, are the world's lightest and strongest propellers. No other manufacturer in the world offers such different models for so many configurations "engine - gearbox - number of blades - diameters". Many 2-blades PLUG'n'FLY, diameters 125 cm, weight less than 500 gr ! 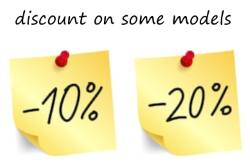 About 30 to 60% less than competitor props. 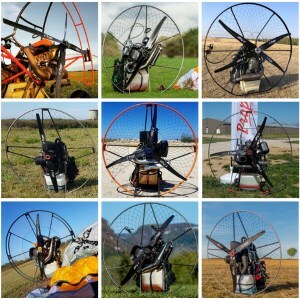 E-PROPS are the sole full carbon propellers for paramotors. The HCF (Helical Continuous Fibers) process, specifically designed by E-PROPS, ensures an exceptional strength of the carbon braid (like a sock) + epoxy resin blade, from leading edge to trailing edge, from blade's foot to tip. Manufacturing process : Resin Transfer Molding (RTM). The PLUG'n'FLY models are fixed pitch. The blades are in two or three sectionnable parts, very simple to assembly. The assembly is correct when the stickers are on the same side. No paint, no varnish, no gel-coat, because those finishes are very polluting, and the E-PROPS company respects an approach of eco-management. Furthermore, paints, varnishes and gel-coats do not allow to easily and properly repair the blades, in case of impacts. The best performances and the lower noise are reached with a straight cut tip. All other configurations are for marketing. All PLUG'n'FLY have an internal shielding in the blades : injection at the leading edge of a special resin with Nanostrength® additive shock. In special cases (as barefoot flights), it is strongly recommended to an extra protection on the blades leading edge, in order to reinforce it, with a polyurethane protection tape used on certified helicopter rotor blades. Strict respect of the MOI limitations given the engines manufacturers. Please note : the blades do not necessarily have the same weight, but must have the same static moment to be well-balanced. If an incident or a shock require an important repair, this one must be realized by HELICES E-PROPS or an agreed repairing center. - A RFID chip is inserted in each blade, for technical monitoring. - Model reference on each blade. - Unique serial number on each blade. 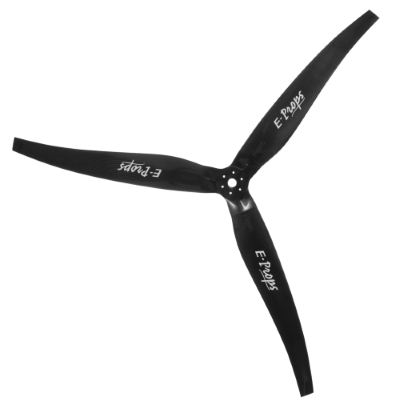 With this serial number, the E-PROPS team can make a new blade, well-balanced with the remaining good blade. Tracking is not important if there are no vibrations. * Dynamic gap : up to 20 mm (the blade can move towards the engine at max power). This gap is depending on the engine assembly, on the cage and on the silent-blocks. * Gap from the frame : it is recommended to part the propeller from the cage of minimum 40 mm. The PLUG'n'FLY drilling paterns are made to be adapted to each engine. Never put a rubber spacer between the reducer and the propeller; the screws would break. 3.000 RPM measured at propeller = engine max RPM / reducer ratio. The power absorbed by the propeller depends on each model. PLUG'n'FLY are adapted only on engines with gear box : never user a PLUG'n'FLY propeller on a combustion direct drive engine (without gearbox). - Every 25 hours of flight or every 3 months : check of the screws tightening.